Yesterday afternoon & evening was the Rhapsody in the Vineyard event for Downtown Corvallis. Thirty vineyards paired with local downtown businesses to spread the joy of local grapes and retail goodies. We joined up with a new WET LABS employee and her fiancee for the event. Fun! 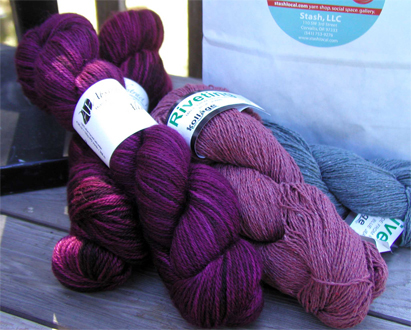 I ditched the group briefly to sneak into Stash, our newest yarn shop, for a fiber fix. Managed to get away with only a lovely plum Leicester Blue wool and cotton yarn created from recycled denim jeans. No ideas yet on what to create, but it should be fun. As a newbie to knitting I feel proud to finish off simple projects like scarves. 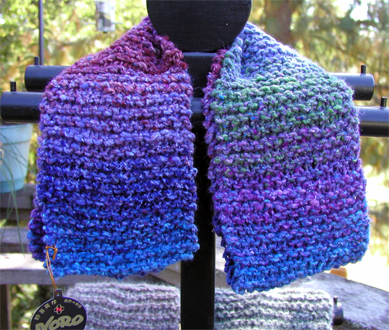 Below are the images of three basic scarves created using Noro yarn purchased from Soft Horizons in Eugene. So lovely to work on size 11 needles. The yarn is used up & I’m missing not working with it. 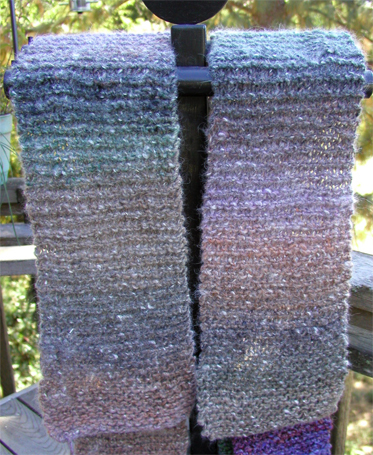 Next project to finish is a mobius scarf using a silk blend. It’s like using thread and I’ve discovered I can’t unravel it. Challenging! There are a few hat projects starting to form. Gotta keep my fingers moving while waiting for things to happen. gail…..there is no cure for this affliction! happy knitting! xoxoxo s.
I think I should count my blessings that it didn’t strike at an earlier age or my house would be more chaotic than it already is! Plus it’s always nice to be an utter newbie at something. Challenges are good! Growing up, I always hated the spelling of my name. Now I embrace the wild wind!